USC Provost Michael Quick, Dean Elizabeth M. Daley, Mark Burnett and David Weitzner. 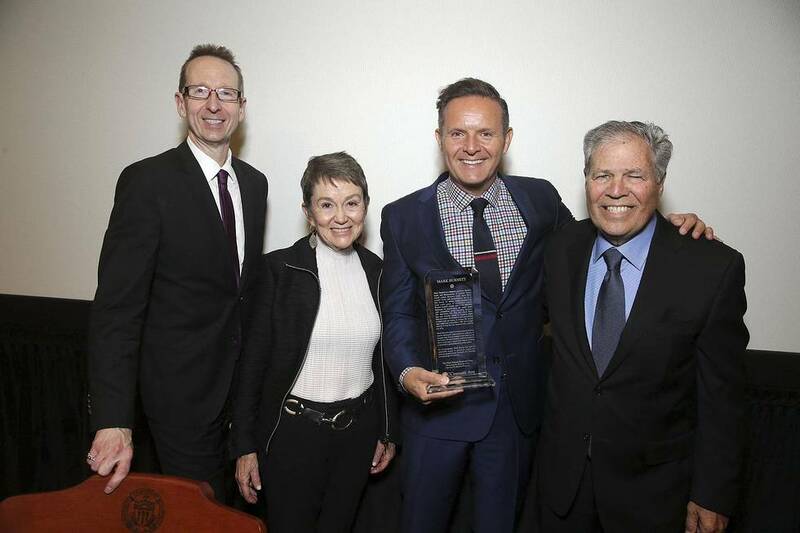 Mark Burnett, Emmy–winning producer and President of MGM Television and Digital Group, was honored on April 27th at the USC School of Cinematic Arts for the establishing The Mark Burnett Endowed Chair at the USC School of Cinematic Arts (SCA). The endowment will support the School’s Summer Production Program and it’s first chair holder is the program’s Director, SCA Professor David Weitzner. Weitzner met Burnett in the summer of 2013, when Burnett’s son was a student in the summer program. Another summer student that year was Fatema Hussaini, a young filmmaker from Afghanistan whose film, Being Woman, about the life of women in her country, brought Burnett to tears. When Hussaini decided she wanted to remain in the United States, Weitzner reached out the Burnett for help and the two men developed a friendship which successfully helping her gain U.S. residency. It’s the School’s twenty-sixth endowed position,a record for programming in the cinematic arts nationwide. The Mark Burnett Endowed Chair joins a long list of positions endowed by entertainment industry luminaries, organizations, companies, and SCA parents such as the Dana and Albert R. Broccoli Charitable Foundation, Dino and Martha DeLaurentiis, The Cecil B. DeMille Foundation, Electronic Arts, Hugh M. Hefner, The Estate of Mona and Bernard Kantor, Walter and Marcia Kortschak and Kortschak Investments, L.P., The George Lucas Family Foundation, Marcia Lucas, Stephen K. Nenno, Patricia Hitchcock O’Connell, Victoria Oakie, the Mary Pickford Foundation, Katherine and Frank Price, Microsoft Corp., Stephanie Rothman, Steven Spielberg, Ray Stark, Time Warner, and the Wunderkinder Foundation.